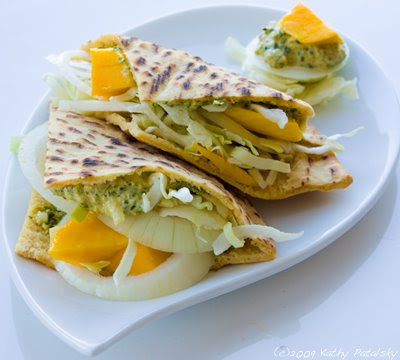 Pesto Mango Pitas: Simply Sunny-licious. Vegan. Pesto Gone Sassy. This pesto sauce is soo good. I sassed it up by amping up the lemon flavor and adding a sweet-saute of toasted pine nuts to the blend. But it is indeed that hefty kick of lemon that leaves you coming back for another spoonful. 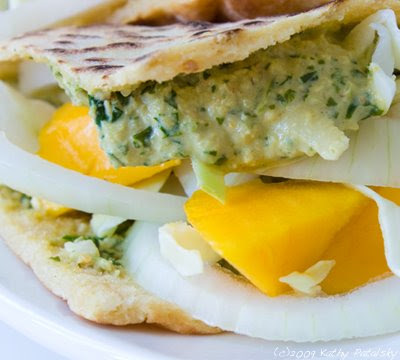 Good thing the pitas won't use all the pesto you make-so there will be plenty for dipping! 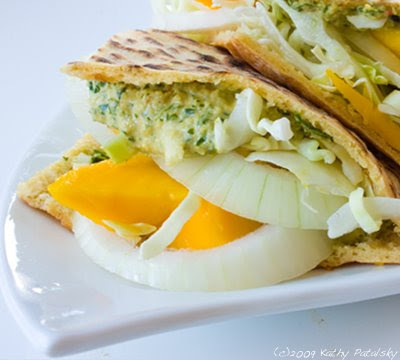 *the recipe below will make about a cup, so you'll have leftover pesto for dipping. Yum. Lightly toast pine nuts in a bit of oil, salt and agave syrup. Be careful-pine nuts only need about 45 seconds over high heat to toast up! The burn very easily. Add all ingredients to food processor and blend until creamy and smooth. 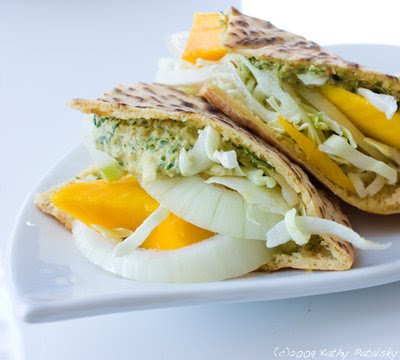 Add a few spoonfuls of pesto, a few slices of mango, and onion to each pita. Add as many greens to stuff the pita full. Serve in triangle pieces. 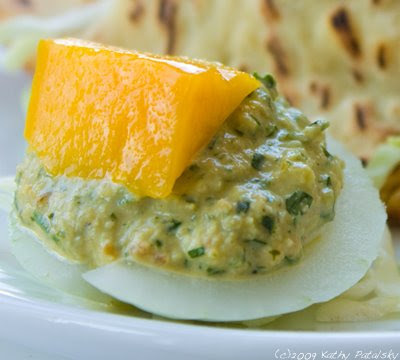 My alternate walnut-cheesy pesto dip recipe is here.